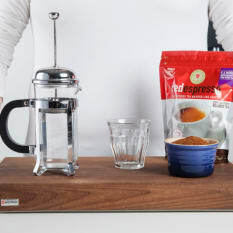 Red espresso is premium rooibos tea refined under patent to an espresso grind similar to coffee, and produced for use in espresso and coffee appliances. Expressed, it delivers a strong, rich-tasting red espresso, complete with a crema that is the pure essence of rooibos. In this concentrated expression, red espresso is richer in flavour, darker in colour and higher in antioxidants than regular rooibos tea. Just like coffee, red espresso is best when prepared using an espresso machine or stovetop espresso maker. Using steam and boiling water under pressure, both appliances extract a clean, rich taste that is the pure essence of Rooibos and deliver a crema unique to red espresso. View more from Teatime Collection, Rooibos Tea, Gifts for The Tea Fanatic , Red Espresso. I very recently discovered this product. I love the fact that the whole family can have guilt-free, healthy cappuccinos in the morning! I now make the most amazing red lattes. Fantastic taste. This product is healthy, tastes amazing and is sold at a great price!